Is The Climate Coalition a challenge to Government? If we speak critically about the Coalition it is because we want the generations which follow ours to inherit an Earth which provides similar benevolence, nurturing and stability to that experienced by human beings up until now. We are disturbed that, in the recent election, media and politicians were able to exclude climate change (and other aspects of the destruction of ecosystems) from public discourse. Our Coalition has a supporter base of 15 million, almost 1/3rd of the electorate; so why isn’t this mismatch of potential strength and actual outcome at the top of our agenda today? We acknowledge that Brexit and austerity are very important; but when placed within the perspective of imminent catastrophic climate change, their overarching priority represents a serious loss of vision. We’re disconcerted to learn from recent research by Carbon Brief that a key promise at Paris to ‘pursue efforts’ to remain below a 1.5 degree Centigrade increase, is on track to be broken by 2021: https://www.carbonbrief.org/analysis-four-years-left-one-point-five-carbon-budget . The suffering predicted for Bangladesh and many Pacific Islands hardly bears thinking about. We imagine that most of you are aware that the current economic system of never-ending growth upon a finite planet is the primary cause of damage to Earth’s ecosystems, including those which control the climate. Members of our group feel afraid when we see media, politicians and business successfully combine to avoid discussion of this; and we experience despair when, generally speaking, Coalition members do not challenge this avoidance. The Agreement has been reached by removing almost all substantive issues concerning the cause of human-induced climate change; and (by) offering no firm plans of action. Instead of substantive cuts in greenhouse gas emissions as soon as possible, the parties treat worst-case scenarios as an acceptable 50:50 chance. It signifies commitment to sustained industrial growth; and to risk management over disaster prevention. The primary commitment of Nation States and multinational corporations is to maintain the current social and economic system. The result is denial that tackling GHG emissions is not compatible with sustained economic growth. We agree that it was an impressive achievement for 194 countries to reach some agreement on a difficult and contentious area. However the absence of commitments which began immediately to reduce emissions and the fact that it will not be until 2020 when the countries announce their new ‘intended contributions to reduce emissions’, gives us considerable concern. Although a number of the NGOs on the Coalition’s Steering Group were critical of many aspects of the Agreement when it was made, the Steering Group now regards it as ‘’a good deal’’. We ask you to note that this date of 2020 will be five years after Paris – and one year before the 1.5 degree temperature increase is predicted to become impossible to stop. We think it fair to say that our Coalition is as yet nowhere near becoming the movement which will give Government and Opposition no choice but to take urgent action. We therefore make two requests to member groups: firstly if you will be willing to read Professor Spash’s article and website and consider bringing them to the attention of your members; and secondly if your group is interested in meeting with others who share concerns similar to the ones we are raising, to contact us as below, if possible by 21st September. 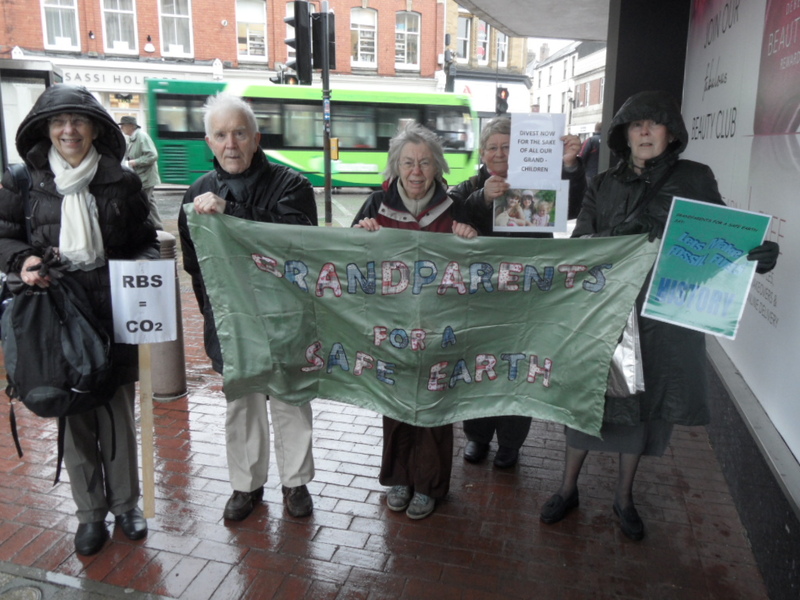 Grandparents for a Safe Earth https://network23.org/gfase/ See particularly Critique of Neoliberal Economic Model and Our Actions. Phil and Sigurd can be contacted via our website above. 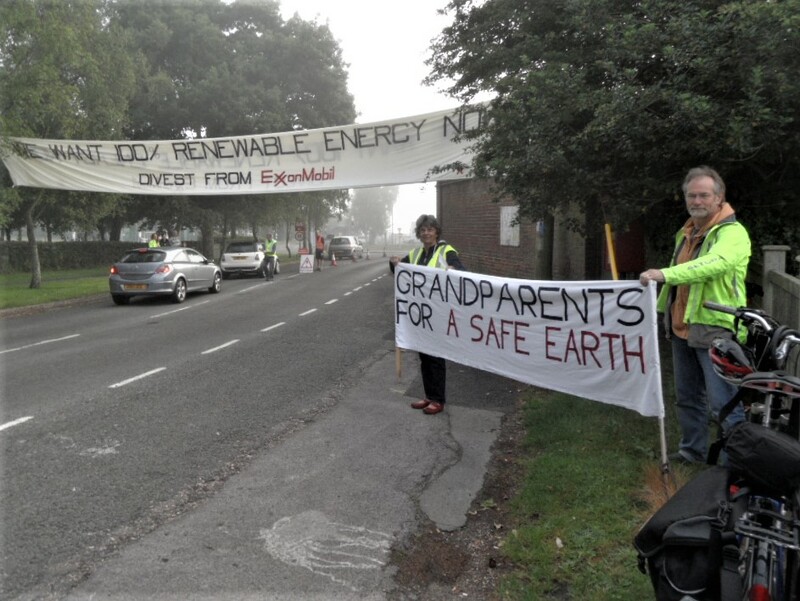 Some members of Grandparents for a Safe Earth joined other faith- and non-faith-based protest groups in a demonstration outside the ExxonMobil oil refinery at Fawley, near Southampton on 1st June. Although the focus of the protest was mainly on the Church of England’s continued investments in ExxonMobil with its policy of large-scale fossil-fuel extraction, GfaSE members were also very aware of investments in ExxonMobil by other organizations, and not least some of their own pension providers (including some County Councils). They will be continuing to raise their concerns with these pension providers. Below is a press release from Christian Climate Action, one of the groups which took part in the protest. Their account includes a statement by a GfaSE member and a photograph of the GfaSE banner. BBC South Today filmed the whole day and they have kindly let us have their film. Yesterday, the day of ExxonMobil’s AGM, a coalition of faith and non-faith groups staged events to call for the Church of England to divest from the company. Early in the morning, demonstrators gathered outside Fawley refinery, handing leaflets to staff as they entered. Then at 4pm, faith and non-faith groups held a vigil outside Salisbury Cathedral before delivering a letter into the office of the Bishop of Salisbury, the lead bishop for Environmental Affairs in the Church of England, requesting that the Church divests from ExxonMobil. Hours before the passing of a resolution on climate change at ExxonMobil’s AGM in Houston – put forward by a group of institutional investors, including the Church of England – campaigners called on the Church to sell its shares in the company whatever the outcome of the vote. Time to Cycle lead a bike ride through the New Forest between the two locations. Ruth Jarman, a member of the Church of England said, ‘When the Church should be showing moral leadership to protect the millions of lives devastated every year by climate change, they’re being taken for a ride by the very company causing the problem. By continuing to hope that ExxonMobil is going to change its stripes, the Church of England is buying cover for one of the most notorious companies blocking action on climate change, including funding climate denying politicians and fake science. Fawley is the only ExxonMobil refinery in the UK, and is the largest and most complex in Europe. The flyer that was handed to staff explaining the unethical behaviour of ExxonMobil is here. The AGM resolution by a group of investors, including the Church of England, called for ExxonMobil to disclose the extent to which global action to tackle climate change will negatively impact the company’s future earnings. The Resolution was passed by 62.3% of the vote despite strong opposition from the ExxonMobil Board. The strategy of ‘engagement’ by the Church with fossil fuel companies does not go far enough for divestment campaigners. For example a letter to the Church Times by 3 bishops and 27 other clergy on 5/5/17 called for the church pensions board to divest from fossil fuels. In 2015 the Church moved to divest £12m from tar sands oil and thermal coal from its £9bn fund but has resisted calls for all out fossil fuel divestment. Church Commissioners have declined to disclose the sum invested in ExxonMobil, thought to be millions: their Annual Report (page 78) discloses the identity of their top 20 holdings only. On 15th May 2017 The Guardian reported that the Archbishop of Canterbury, Justin Welby, may have played a crucial role in the decision by the investment company BMO Global Asset Management, to dump £20m of shares in firms such as BHP Billiton, the Anglo-Australian mining giant, because of climate change. The Archbishop is President of BMO’s responsible investment committee. The campaigners’ coalition includes 350.org, Christian Climate Action, Fossil Free UK, Grandparents for a Safe Earth, Salisbury Fossil Fuel Divestment Campaign, Salisbury Greenpeace, Time to Cycle. There is a petition to register support for the Church of England to divest from fossil fuels here. 10.The fossil fuel divestment movement saw its beginnings in North America, Europe and Australia and has since become the fastest growing divestment movement in history. Global commitments to divest have already reached 710 institutions across 76 countries, representing well over US$5.5 trillion in assets under management. 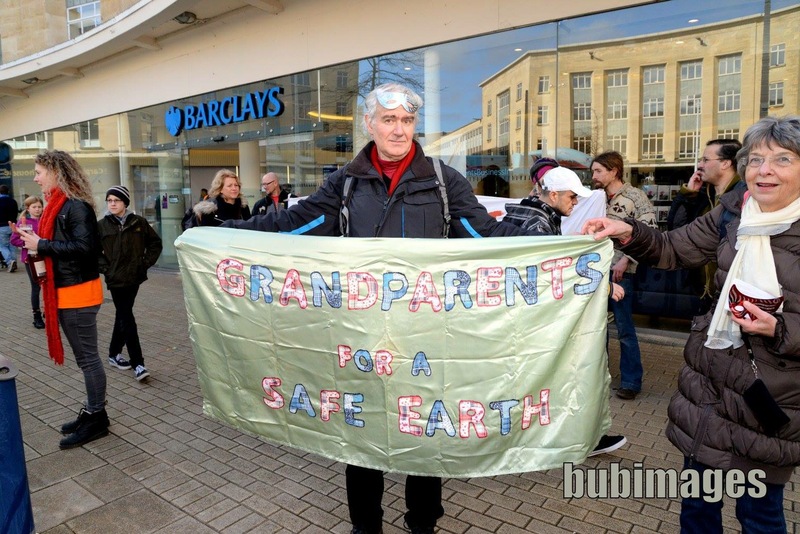 In October 2016 members of Grandparents for a Safe Earth joined with other groups in Bristol to publicise, and protest against, Barclays Bank’s investments in fracking instead of directing this funding to renewable energy and thus contributing to keeping fossil-fuels in the ground. Below is a 3-minute YouTube video about this. Grandparents for a Safe Earth is a secular and non-party-political organisation which aims to be as inclusive as possible. Our members include different faiths and ideologies. We are willing to put on our website actions by a different group if one or more of our members have taken part. We do so today with a report of this action by five members of Christian Climate Action, one of whom is GfaSE member Phil Kingston (Second from the left in this photo). Five members of Christian Climate Action, Ruth Jarman, Westley Ingrams, Helen Whithall, Martin Newell and Phil Kingston, whitewashed the wall of the Department of Energy and Climate Change (DECC) in London on Monday 30th November and wrote Dept for Extreme Climate Change in large black letters. They wanted to make a stand against the death and destruction that is being aided by the policies of the Dept. of Energy and Climate Change. ”It speaks fine words about the seriousness of climate change, but its current policies are undermining global efforts to confront this threat, most importantly at the meeting of world leaders at the Paris Summit this week. E.g. it has excluded new onshore wind farms from a subsidy scheme a year earlier than planned; brought in budget changes which reduced the incentive to buy low-emission vehicles; and scrapped the policy for new homes to be carbon neutral”. The five, acting on the first day of the Climate Summit in Paris, arrived at the DECC wearing white paint suits with ‘DECC’ on them. 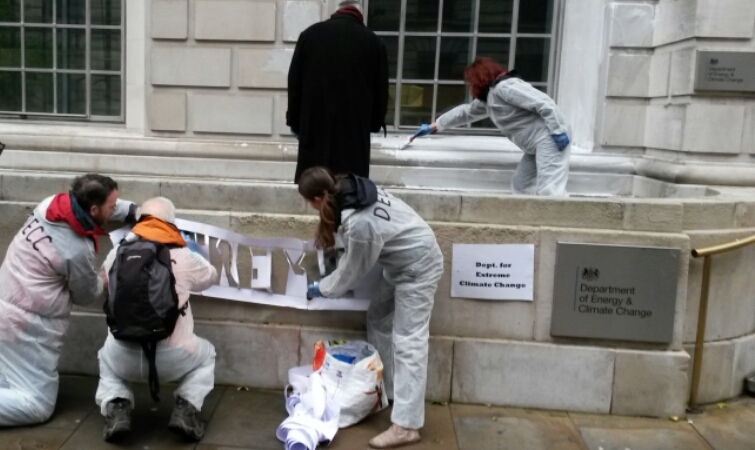 They delivered a letter to Amber Rudd, the Energy and Climate Change Secretary, whitewashed part of the wall, re-branded it as the ‘Dept for Extreme Climate Change’ and then knelt around a skeleton in a ‘whitewashed tomb’ and prayed until they were arrested. They were charged with criminal damage and bailed to appear at Westminster Magistrates Court on 15th December, when they pleaded not guilty and will stand trial at Hammersmith Magistrates Court on 31st May. This Silent Procession in Bristol city centre to remember people killed by Climate Change was a moving experience for those who took part and for many observers. Organised by Grandparents for a Safe Earth (https://network23.org/gfase/ ) participants walked in solidarity with the communities across the world most affected by Climate Change. They linked deaths from extreme weather to the continuing emissions of Carbon Dioxide from the human use of fossil-fuels and the massive worldwide investments in fossil-fuels by most of the UK banks. People brought flowers and carried a coffin to remember those who have died. They placed the flowers outside each city centre bank which makes such investments and took a letter into each bank to be sent on to the bank’s Chief Executive Officer, asking for a rapid reduction in fossil-fuel investments and an equally rapid and extensive investment in the development of renewable energy and energy efficiency. Our letter also asked if the bank is willing to sign the BankTrack Pledge http://www.banktrack.org/show/news/banktrack_launches_paris_pledge_campaign which calls upon banks to follow the example of Bank of America and Credit Agricole in making commitments to pull out of the coal mining sector before the Paris UN Meeting in November. (If all of the coal plants proposed worldwide are built, the outcome will be disastrous because it will be impossible to keep the increase in temperature below the 2 degree Centigrade). Phil Kingston, a member of Grandparents for a Safe Earth, welcomed people to the procession, saying ‘’We grandparents and elders acknowledge our own part in this destructive process and are more and more committing ourselves to keep fossil-fuels in the ground’’. At the last bank, people lay on the ground to represent those who had been killed by climate change. This was a moving experience for passers-by, bringing home to them the reality of what is happening across the world, a reality which is predicted by the Royal Society and the US Academy of Sciences to become substantially worse unless there is an urgent and radical reduction in the use of fossil-fuels. 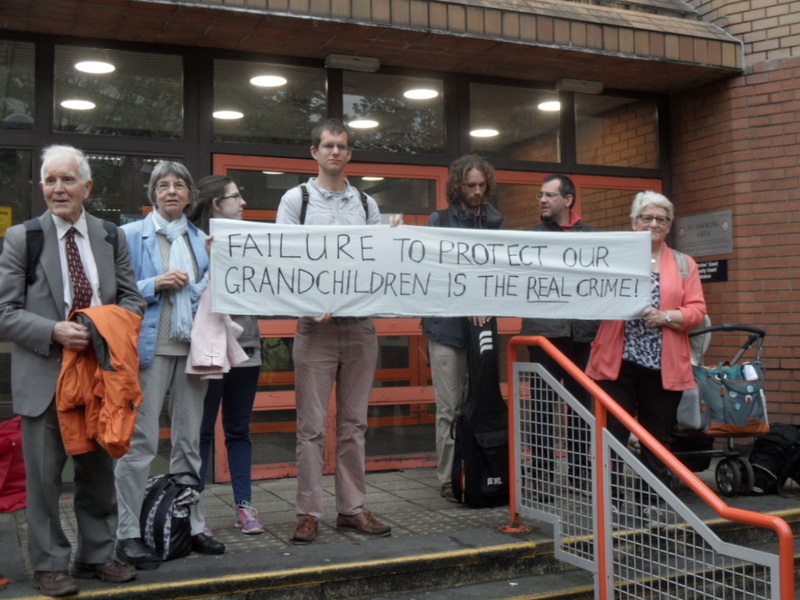 Grandparents for a Safe Earth are attending as many hustings in Bristol and South Gloucestershire as they can in order to offer leaflets to people as they go in. Wherever possible we also ask a question about the marked absence of Climate Change from the political discourse in this election. The current extremes of weather world-wide are caused by an increase in temperature above pre-industrial levels of 0.8 of a degree Centigrade. Who says so? The Royal Society and the US Academy of Sciences, 2014. They add that if the current trajectory of CO2 Emissions continues, the average world temperature increase will be at least 4 times this. This poses enormous dangers for our descendants. We are disturbed that the actions of Governments up to now have been totally inadequate to the seriousness and urgency of the task. In this election, THE CLIMATE CHANGE ELEPHANT IS IN THE ROOM AND WE ARE HARDLY SEEING ITS SHADOW. Why are the leaders of almost all political parties keeping this off the election agenda? Our descendants are far too important to allow this. We ask each of you why you think climate change is being given very low priority in this election? ( And please don’t respond in terms of what your party has done or is planning to do because that isn’t our question. What we want to know is why this subject is not being given anything like the priority which our descendants deserve). 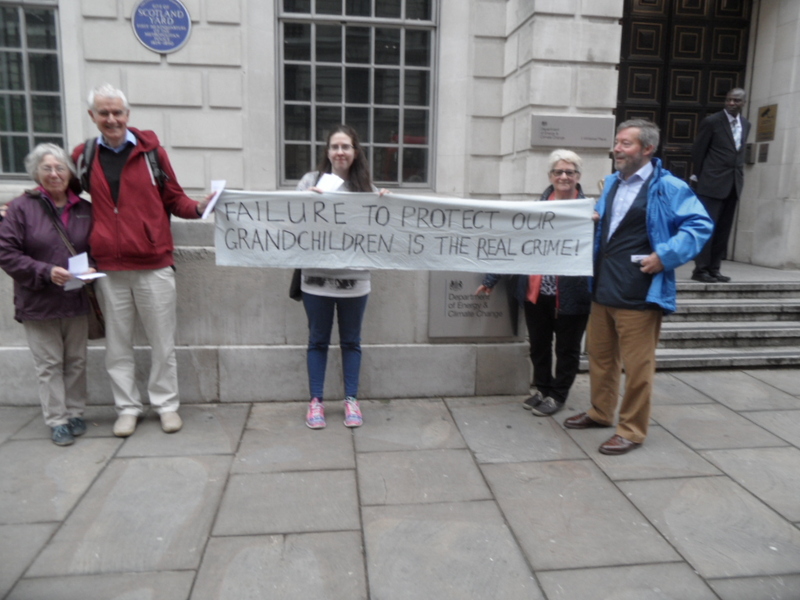 Grandparents at the Bristol Flashmob! Huge Investments by some UK Banks in Fossil Fuels are damaging Planet Earth. A number of reputable scientists and economists including the former UK Government Chief Scientist Sir David King; Lord Stern, the author of the Stern Report on Climate Change; and staff at the Potsdam Institute, have expressed concern that the majority of the known reserves of fossil fuels will have to be left in the ground if the internationally agreed 2 degree C limit in temperature increase is to be honoured. Instead of working to leave fossil fuels in the ground and massively to invest in renewables and energy efficiency, some of the large UK Banks appear to be placing their profits before our security with the outcome that the generations which follow us will inherit a seriously damaged Earth. 1. One of our members closed his account at a Bristol branch of Santander. According to www.moveyourmoney.org.uk, Santander Bank has over £3.5bn invested in oil, gas and coal extraction. 2. 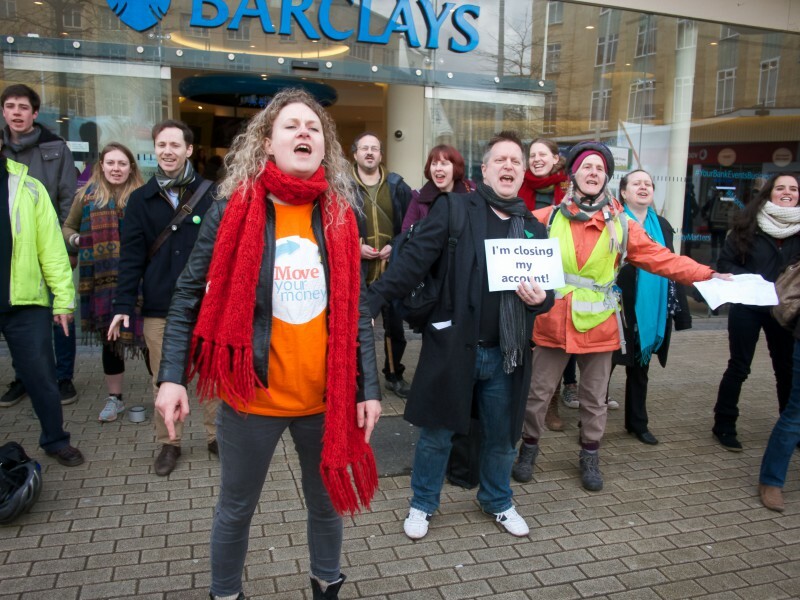 We took part in Bristol Disinvest’s Flashmob at Barclays Bank in Broadmead, Bristol. 3. One of our members disinvested from her account at the Taunton branch of RBS. It was cold, wet, windy and very enjoyable, publicising the fact that, according to www.moveyourmoney.org.uk, RBS has over £14bn invested in oil, gas and coal extraction. This conference was organised by a number of Christian groups in Bristol who are concerned about Climate Change. 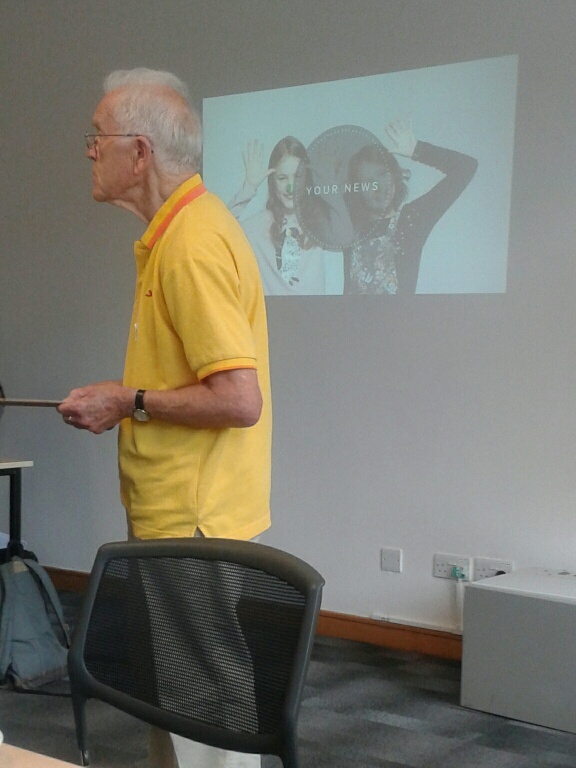 Phil Kingston, a member of Grandparents for a Safe Earth spoke about the work of the group and about another group – Christian Climate Action – which like GFASE is also willing to take nonviolent direct action when dialogue does not bear fruit.